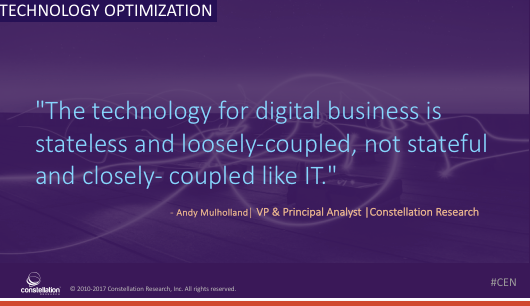 4 Provocative Technology Optimization Quotes | Constellation Research Inc.
Andy Mulholland, Constellation Research VP & Principal Analyst, leverages his experience as the former global CTO of CapGemini to offer insights about Technology Optimization. He often advises executives on how to communicate effectively and intelligently to boards of directors about AI, IoT, and unravels the complexities of the middle office, a new abstraction layer that has emerged. It is orchestrating systems of experiences as we move away from systems of engagement with new business models. We provide weekly thought leadership quotes for anyone interested in non-mainstream, disruptive thinking from our seasoned Constellation analysts. The full archive remains accessible for our Constellation Executive Network members. "AI may have a similar effect on office work as industrial automation brought to the factory floor." "IoT will be a network of gateways between edge activity groups, not an Internet of routers connecting cloud data centers." "The technology for digital business is stateless and loosely-coupled, not stateful and closely-coupled like IT." "CAAST—the combined integration of Cloud, Apps, AI, Services and Things— is the underpinning technology driving change."